This antibody is specific to mouse MCP-1. CHO expressed, recombinant mouse MCP-1. IHC- central nervous system of rats or mice with experimental autoimmune encephalomyelitis. Our Abpromise guarantee covers the use of ab21396 in the following tested applications. ELISA Use a concentration of 5 - 10 µg/ml. To obtain a linear standard curve, serial dilutions of MCP-1 recombinant protein ranging from 2000 to 15 pg/ml are recommended for each ELISA plate. in 100µl volume for intracellular immunofluorescent staining and flow cytometric analysis to identify MCP1 producing cells within mixed cell populations. WB Use at an assay dependent concentration. Predicted molecular weight: 11 kDa. IHC-FoFr Use at an assay dependent concentration. Samples need to be saponin-treated. Ab21396 staining human MCP-1 by ELISA. 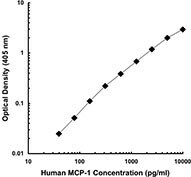 Image shows a standard curve obtained with increasing concentrations of human MCP-1. Publishing research using ab21396? Please let us know so that we can cite the reference in this datasheet. Below is a link to a paper that uses clone 2H5 (same clone as ab21396) for acetone fixed, frozen tissue staining (Figure 8). This customer already used ab21396 (Anti-MCP1 antibody [2H5]) to conducted the wb with rat bladder tissue sample, and the results shows strong signal at 25kDa, and the references also show in the 25kDa, however, our website datasheet indicated the predicted molecular weight should be at 11kDa, therefore, she wants to know which one is the major band size? I attached her experiment image in this letter. Reference: Multi-analyte profiling reveals matrix metalloproteinase-9 and monocyte chemotactic protein-1 as plasma biomarkers of cardiac aging. http://www.ncbi.nlm.nih.gov/pubmed/21685172 2011 Aug 1;4(4):455-62. Epub 2011 Jun 17. Would you please help this customer to solve the problem or offer her any suggestions? As shown on the following SwissProtlink, http://www.uniprot.org/uniprot/P14844, the calculated molecular weight of the Rat MCP1 is 16.4 kDa, not 11 kDa as for Human. The differences in the molecular weight observed with WB can be due to post transcriptional modifications such as glycosylation. I contacted the source of the antibody whoinformed me thatthey have not validated the product in house for western blot. The only data they have for the use of this clone [2H5] in Western Blot come from a publication by Luo, Y. et al., 1999, J. Immunol. 163:3985. 1) Wo bekomme ich einen sekundaeren AK fuer Armenian Hamster her? WB, FlowCyt, ICC/IF? 2) Gibts den auch Fluorochrom-konjugiert? Vielen Dank für Ihre Anrufe. Wie besprochen können wir den MCP1 Antikörper für Western blot und Durchflußzytometrie garantieren (www.abcam.com/Abpromise). In der Immuncytochemie/Immunfluoreszenz (ICC/IF) wurde er noch nicht getestet, aber es bestehen gute Chancen, dass er funktioniert, da er ja für die Immunhistochemie getestet ist. Es freut mich zu hören, dass Sie unser Angebot unseren Antikörper Ab21396 in der ICC/IF zu testen, annehmen möchten. Wie am Telefon besprochen, können Sie den Gutscheincode zum Kauf eines weiteren Antikörpers einsetzen, sobald Sie uns ein Abreview für diesen Antikörper eingereicht haben. Der Discountcode hat die Nummer 100%ABR-T7ATQ und kann zum Kauf weiterer Produkte eingesetzt werden. Der Code wird gültig, sobald Sie uns ein Abreview für diesen Antikörper über den Test in ICC/IF eingereicht haben. Bitte geben Sie diesen Code auch im Abschnitt “Additional Notes” des Abreviews mit an, so dass wir wissen, dass sich dieses Abreview auf die Gutscheinaktion bezieht. Der Code wird dadurch aktiviert. Bitte kontaktieren Sie bei der nächsten Bestellung unsere Kundendienst mit dem Code und der ursprünglichen Bestellnummer. PS: Die Bestellung (#1064638) wurde wie gewünscht storniert. Thank you for your help.The translation: Human umbilical cord endothelial cells and smooth muscle cells in rats are right.And the customerconfirmed that MCP-1 is indeed expressed by these tissues,but they didnot get good results with the ab21396 which has seriously affected their schedule,meanwhile they thought there is no necessary to do a positive coontrol,they want a new vialof antibody to try again. So,please help me to process it,thank you very much. Thank you for kindly confirming these details as this enables us to closely monitor the quality of our products. I am glad to learn that the customer expects expression of the protein in these tissues, because following good scientific practise a positive control is paramount which is why reviewers certainly will request it. As the protocol seems absolutely fine to me, I would be pleased to arrange a replacement product free of charge with a new vial of ab21396. I am forwarding these details on to our Distributor’s Team who would be happy to organize this. Thank you for your help and cooperation. Please do not hesitate to contact us if you need anything further. Dear scientist: My customer used ab21396 ( Lot. #GR37-1 ) in WB assay, but they didn't get a satisfactory result. The details listed as below. 1. Order details: · Batch No: GR37-1 · Purchase No or order No: PO#110914-1 and order no: 949109 · Antibody storage conditions (temperature/reconstitution etc) Aliquoted and stored at 4℃ 2. Please describe the problem (high background, wrong band size, more bands, no band etc).No band 3. On what material are you testing the antibody in WB? · Species: 人脐带内皮细胞和大鼠平滑肌细胞 · Cell extract or Nuclear extract: Cell extract 4. The lysate How much protein was loaded: 40ug-80ug What lysis buffer was used: RIPA What protease inhibitors were used: PMSF What loading buffer was used: 5×loading buffer Did you heat the samples: temperature and time: 100℃ 10min 5. Electrophoresis/Gel conditions/ Transfer conditions Gel percentage : 12%-15% Transfer conditions: 300MA 40-60min 6. Blocking conditions Buffer: PBST,TBST Blocking agent: milk, BSA, serum, what percentage: milk or BSA Incubation time: 2h Incubation temperature: TR 7. Primary Antibody · At what dilution(s) have you tested this antibody: 1:500 · What dilution buffer was used:PBST or TBST · Incubation time: 4℃overnight · Incubation temperature: 4℃ · What washing steps were done: PBST or TBST 10minX3or4times 8. Secondary Antibody Specification (in which species was it raised against)?.rabbit to Armenian Hamster At what dilution(s) have you tested this antibody: 1:1000;1:2000 Incubation time: 2-3h Wash steps: PBST or TBST 10minX3 or 4times Do you know whether the problems you are experiencing come from the secondary? no. 9. Detection method ECl, ECl+, other detection method: ECL, ECL+ 10. Background bands · Have you eliminated the possibility that any background bands could be due to the secondary antibody? (Run a “No primary” control): yes. · Is the blocking step sufficient? Yes. · Are your washing steps sufficiently stringent? (Multiple short washes are more effective than fewer longer wash steps) yes · At what size are the bands migrating? Could they be degradation products f your target? 11kd 11. Optimization attempts · How many times have you tried the Western? 10times. · Do you obtain the same results every time e.g. are background bands always in the same place? Yes, no band. · What steps have you altered? We could got good result follow the same protocol. Thank you for taking the time to complete our questionnaire and contact us. I am sorry to hear your customer has had difficulty obtaining satisfactory results from this Anti-MCP1 antibody. We have received no complaints about this product therefore I am concerned it is not working for them. The protocol indeed looks absolutely fine to me. However, to fully understand the procedure I would like to ask which material has been used. The google translator gave the translation: Human umbilical cord endothelial cells and smooth muscle cells in rats. Can you confirm this please? It would be especially important to know if it is umbilical cord or spinal cord? Also, I would appreciate if the customer could confirm that MCP-1 is indeed expressed by these tissues. To my knowledge, spinal cord tissues or mixed cortical tissues (as investigated by users of our other MCP-1 antibodies, see respective Abreviews ab25124) might be an appropriate positive control, as would be smooth muscle treated with 100µg/ml glycated LDL (ab9669). If the customer cannot get hold of these controls, I might be able to send a recombinant MCP-1 protein as positive control, such as ab9780 or ab73866. Click here (or use the following: https://www.abcam.com/index.html?datasheet=9780). Click here (or use the following: https://www.abcam.com/index.html?datasheet=73866). As the antibody was purchased in September, the customer is covered by our Abpromise guarantee. Therefore if the antibody does not show any results with the positive control, I would be happy to offer a refund or replacement antibody vial. Please do not hesitate to contact me should you have additional questions. I want to check that if the product ab21396 can be done mmunohistology on paraffin tissues? Thank you. Regards. Looking forwards to hearing from you soon. Thank you for your enquiry. I have checked with our laboratory and it seems that this product has not been tested in paraffin embedded sections. The application that we have stated on the datasheet refers to frozen sections, and tissue/cells grown on slides. However, this does not mean that the antibody will not work in this IHC-P application, just that we have not tested it and therefore, can not guarantee that you will get good results. If you decide to go ahead and purchase this product, we encourage you to submit an Abreview via the online product datasheet. We always encourage customers to send their results back to us, whether positive or negative, and we make all product information available to researchers. We reward each Abreview with Abpoints which can be used for discounts off future purchases and gifts. To find out more about our Abreview system, please see the following URL: https://www.abcam.com/abreviews I hope this information helps, please do not hesitate to contact us if you need any more advice or information. Customer needs IHC-frozen protocol with saponin treatment. Rat retina fixation protocol and secondary. Thank you for your enquiry. The following paper has a brief description of a procedure for staining frozen sections of rat retina with MCP-1 antibody. It is not the same antibody as our hamster antibody but the procedure is standard. The important thing is to use a buffer with 0.1% saponin for the whole procedure, because it permeabilizes membranes and allows the antibody access to the MCP-1. http://www.iovs.org/cgi/content/full/42/7/1547 For a secondary antibody, if you want use a horseradish peroxidase detection, use ab6892, goat anti-hamster IgG: https://www.abcam.com/index.html?datasheet=6892 Your sections will need to be blocked against non-specific binding of the anti-MCP-1 antibody to the tissue by first incubating the sections with normal goat serum. Our standard protocol for immunostaining frozen tissue is found at a link on this page: https://www.abcam.com/index.html?section=ihc&pageconfig=technical∫AbID=21396&mode=problems If you want to use a fluorochrome-tagged secondary antibody (eg FITC) e-mail me back and I will recommend one of our anti-hamster conjugates. I hope this information helps, please do not hesitate to contact us if you need any more advice or information. Thank you for your responses before. I am sorry for my first unclear enquiry. I am doing immunohistochemistry ,so I just want a IHC postive control, and what tissue is the positve control in my experiment. Thanks a lot again! Thank you for your reply. A MCP-1 positive control in tissue is a bit tricky as production usually tracks with disease states (for example trauma or autoimmune disease). One of the best positive controls for MCP-1 in tissue is the central nervous system of rats or mice with experimental autoimmune encephalomyelitis (see Journal of Immunology 156:3017-3023). Other labs used ischemic muscle (see 1996 or J. Surg. Res. 134:145, 2006). If you don't have access to tissues from these disease states, you might consider an adherent cell line such as the small cell lung carcinoma cell line NCI-H69 that has been treated with a drug such as doxorubicin (see Int. J. Cancer 103:380, 2003). You can grow these cells on slides as use as positive controls for IHC pretty easily. I hope that this information helps? If you have any additional questions then please get back in contact with me.